Veja a cidade de Ho Chi Minh de uma perspectiva diferente durante um cruzeiro de barco pelo rio Saigon. Passe pelas vias verdes locais e áreas urbanas enquanto admira o impressionante horizonte da cidade. Embarque no barco pela manhã e leve um café da manhã leve acompanhado de chá, café e suco fresco. Hotel pickup e drop-off estão incluídos. Após o embarque no hotel na cidade de Ho Chi Minh, siga até o píer e embarque no navio - um luxuoso barco de aço com interior de madeira. Prepare-se para um delicioso café da manhã com baguetes e saladas servidas com suco de laranja fresco, café e chá. Durante o seu cruzeiro pela manhã, dê uma olhada no desenvolvimento urbano e áreas rurais vizinhas do rio Saigon. Contemple os arranha-céus imponentes em meio ao horizonte no centro da cidade antes de seu passeio de barco terminar no coração de Saigon com o desembarque em seu hotel. Tour guide was awesome. It was very helpful when you got back on the street even. Breakfast was the best as well, great selection....thank you so much!!!! We simply love it! There were 5 of us all ladies and it was our first trip to HCMC. This cruise is an excellent way to see the city from a different perspective. The Government also did a good job in cleaning up the river. Ms Hanh and Mr Anh from The Saigon Boat Company were professional, very pleasant and fluent in English. They were punctual in picking us up from the hotel and we were shown where the lifejackets were the minute we stepped onto the boat. The boat is fairly new and well maintained. The breakfast served was scrumptious with a variety of drinks and juices. All in all, it was a highly enjoyable 2-hour ride. And I dare say, we will definitely sign up for another cruise the next time we head back to HCMC. Excellent trip, The staff were fabulous, couldn't do enough for us. It was a relaxing looking at Ho Chi Minh, watching the city wake up form a river vantage while enjoying a fresh breakfast was truly worthwhile. The walking tour showed us parts of the city we would never found our selves and finished off at an out of the way restaurant that served delicious Vietnamese rolls. If you have done the usual tours then this one will be the icing on the cake. This tour is fantastic! The best by far in my opinion....I opted for hotel pickup/drop off and the Chinatown tour combined. Do it! Trust me you do not want the hastle of organising your own transport!!! Hanh collected me from my hotel and drove me in a private car to the doc where i boarded a beautiful timber motor launch. This boat would look quite at home in the canals of Venice and is spacious and very comfortable with full shade. A few mins after boarding you begin your tasty breakfast lovingly prepard by Nhul. Throuhout the boat trip all your needs are met, there is even a toilet on board. 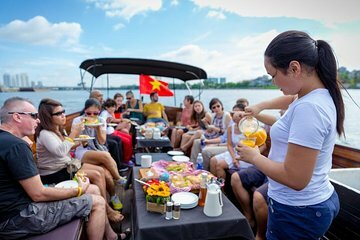 The tour guide Johnny is very knowledgeable and expalins the history from the begining of french colonialism etc at the end of the boat trip we doc in a different area and are collected by private car and brought to Chinatown in district 5. This is a walking tour around the main sites, smells, architecture, temples and markets of Chinatown including the silk road. Hanh, Nhul, and Johnny escorted me around and made me feel like a VIP at all times. Was truly an amazing authentic experience including some back alley local restaurants to refresh and eat like a local. Amazing food! I dont normally rave about a tour but this for me was a fantastic experience. I recommend the complete package, well worth it. Cheers. Wonderful experience in Saigon! Breakfast was delicious, the staff was professional and the boat trip was a pleasant and unique way to explore this beautiful city. Highly recommended to people who are looking for an authentic experience!